You need to forgive to be free. If you are free, you are happy. You can have success on the outside, but if you are bitter on the inside, it will just spoil and ruin everything. You must deal with the inside first. You must get the root of the problem; then you can be really happy. You may think, "I can't do it. I cannot forgive him. He hurt me so badly." Stop thinking that way. Pray. 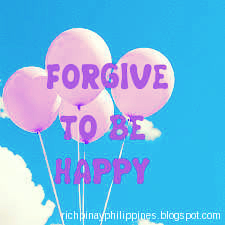 You must remember this: You are forgiving someone for your own sake. Not for him, not for someone else. Forgive, so you can be whole again.